Hi guys, I am a new member here but not new to wet shaving. I am a daily user, and after much experimentation, I go with a SAS that is a one pass WTG shave. For weddings and such I go for the 3 pass shave, but on a daily basis it doesn't work for me. But I do like to collect razors. My favorite category to collect is the Gillette Adjustables. I came here to share a photo I just took of part of my collection. I took it because I haven't seen anything like it and what it depicts is my take on what the various models of Gillette Adjustables are. To me there are 18 different distinct models of Gillette Adjustables. Any questions or comments are greatly appreciated. Moderator Note: Link to unauthorized website removed. Thanks for sharing and welcome! That's a nice looking collection, my DE passion is for British made Gillette Aristocrats and I have 6 or 7 of those. Hope you keep posting. Wow! I don't think I've ever seen that many Toggles in one place! And the overall collection is fantastic. Thanks for sharing and congrats on your gems. Wow. I've never seen a black bottom dial. Impressive collection. Welcome to TSN and thanks for sharing your impressive collection. If you have a chance, go to the Introductions section and introduce yourself, so the members can give you a proper welcome. We look forward to your sharing your expertise. Beautiful collection! I have always been drawn to those bottom dials especially in gold. Welcome and wow what a collection. (03-15-2017, 11:05 AM)eengler Wrote: Beautiful collection! I have always been drawn to those bottom dials especially in gold. Ha well you've got me there! That is the one weird one in the photo! The gold Bottom Dial in the photo (#8) was an after market replate. I am representing it as an example of a Nickel 1-9 Position Bottom Dial because that is how was originally made at the factory. 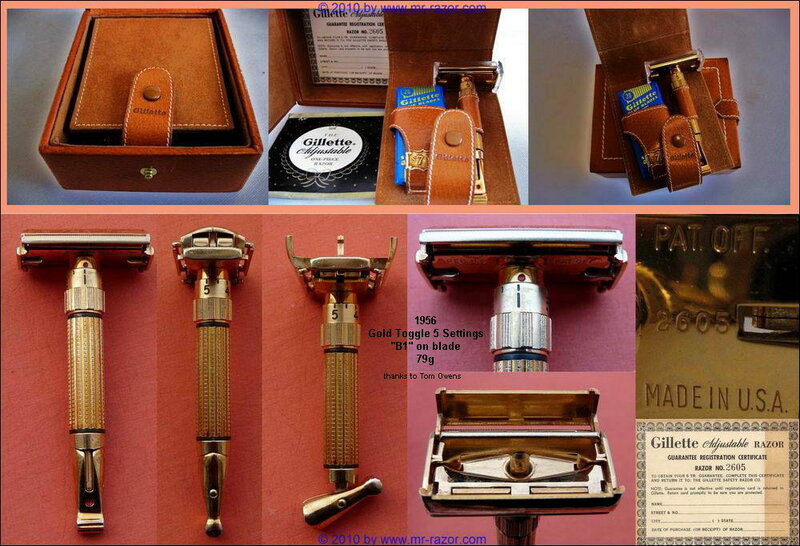 Gillette never manufactured a Gold Bottom Dial in either the 1-9 Position or 1-5 Position type. I got it from Razor Emporium as a "Revamp" project. 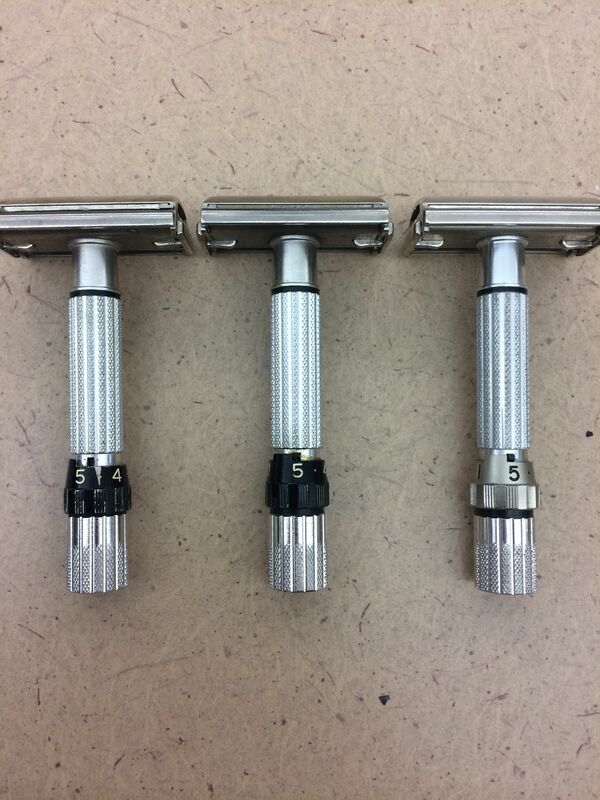 All the other razors in the photo have the plating as they came from the factory. Do you think it detracts from the picture, having Matt's gold replate in the picture??? Some people think that no self-respecting collector ever buys a replated razor. I was hesitant to do it but it is beautiful and I have never seen another like it. But to be crystall clear, Gillette never ever made a Gold Bottom Dial. I just hope that using it was not confusing to people. 5 toggles? Wow. Nice collection- welcome and please share more! What did you say that address was ? You home all day ??? (03-16-2017, 12:10 AM)grayhane Wrote: What did you say that address was ? You home all day ??? Yes!!! I'm a practically a darn shut in. I run a business out of my home so I'm always here. But I also have a shotgun. Ha ha... Here is one of my prizes. It is #1 in the Adjustable Family Photo. I got it from Tom Owens. Achim at Mr-Razor has an older picture of it on his website. I've never seen that black bottom dial before. are there other examples out there? (03-16-2017, 11:02 AM)Lando Wrote: I've never seen that black bottom dial before. are there other examples out there? Yes there are a small number five (5) or less I am guessing. Amazing collection and inspired... To collect more and spend more! (03-16-2017, 01:40 PM)Jackson Wrote: Amazing collection and inspired... To collect more and spend more! Thanks guys. Yes it can be expensive. But some guys collect watches or even fancy sports or vintage cars. I feel I am getting of cheap compared to some. Think about this: There are people who collect stamps!? You can spend $2000 for a stamp! What is it? Some ink on a darn piece of paper - and for $2000! A beautiful well made razor or adjustable razor, that is a mechanical marvel, is a great bargain compared to a stamp. Quote: Thanks guys. Yes it can be expensive. But some guys collect watches or even fancy sports or vintage cars. I feel I am getting of cheap compared to some. Think about this: There are people who collect stamps!? You can spend $2000 for a stamp! What is it? Some ink on a darn piece of paper - and for $2000! A beautiful well made razor or adjustable razor, that is a mechanical marvel, is a great bargain compared to a stamp. Agree with you there. I also like music and sound and there are "audiophile" cables that run thousands of dollars per foot and $100,000 for a 10 foot pair(and they become "obsolete" in a year because something new comes out every year) so collecting razors that will never be made again for a few thousand dollars is cheap.